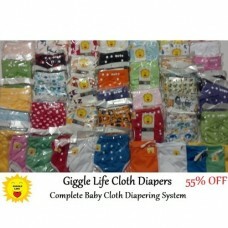 The Giggle Life Complete Baby Cloth Diapering System provides you with everything your baby needs from birth to potty trained at a super low package price. Our amazing cloth diapers will fit babies from 7-36lbs with the adjustable button set ups. Base on your selection from the "Cloth Diaper Selections" drop menu below of gender neutral, boys, or girls you will receive the following colors and patterns.